This adventure is our Journey on the Wild Coast: From the Puget Sound to the Bering Sea: Four thousand miles along the edge of the Pacific, by foot, packraft, and skis. An expedition to explore and communicate the broad environmental issues facing this region. From Seattle to the Aleutian Islands, by human power: Journey on the Wild Coast will be an unprecedented four-thousand-mile expedition along the northern edge of the Pacific Ocean, through some of the most rugged terrain in the world. No road or trail follows this steep and fragmented coastline. 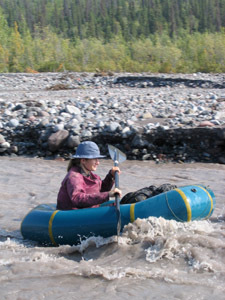 We'll be traveling through forests, between islands, around glaciers, and across the tundra - by foot, packraft, and skis. No one has done this before. 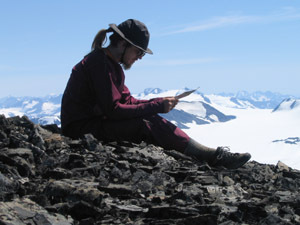 We'll begin at our front door in the heart of urban Seattle (June 9, 2007), and will pass through some of the most remote and wild places in North America, finishing at the first Aleutian island (March 2008). This nine-month journey will take us through summer, fall, and winter - from Seattle to Unimak Island. Most of this website is my fault, though Hig and I collaborate on the pictures. I'm 27, a Seattle native, and grew up hiking with my family in the Cascade mountains. I have a masters degree in Molecular and Cellular Biology, but am currently employing myself as a jewelry artist, among other things. In addition to trekking and photography, I like to paint , and I study aikido. My main project these days is using my wilderness treks to raise environmental awareness of the issues facing parts of Alaska and the northern Pacific coast, through photography, writing, and the web. See my work on the proposed Pebble Mine, and our next big projcet: Journey on the Wild Coast, whice will cover a four-thousand-mile span of coast from the Puget Sound to the Bering Sea. We're starting a new organization: Ground Truth Trekking to pursue these environmental projects. Contact me at mckittre at gmail dot com. Hig is a grad student in geology, studying tsunamis and the sand deposits they leave behind, and hurrying to graduate by June 2007 so we can leave on our next adventure. In the course of his research he's traveled to Kamchatka, Nicaragua, Sri Lanka, Indonesia, and Thailand, studying the signs left behind by tsunamis, particularly the giant 2004 Sumatra tsunami. You can check out news and pictures from his Sri Lanka trip. He's 30, and grew up in the small town of Seldovia, AK. This would explain why we've done a lot of hiking on the Kenai Peninsula, dropping in to visit the folks on the way to or from various wild adventures. His hikes started with short forays into the woods behind his house, and have steadily expanded in scale to the hundreds of mile treks we do today. You can get in touch with Hig at hig314 at gmail dot com.